What’s the first thing you think of when anyone talks about Nose-to-tail dining? For many people, the first thought would be offal, odd parts and cuts that people generally don’t eat. Dehesa’s new menu changes all of that, making this a completely different experience. Focusing on hearty group dining settings with solid servings of alcohol, Chef Jean-Philippe Patruno is dishing out easy to eat items that carry a whole lot of heart. Instead of simply using parts in his cooking, Jean-Philippe decided to focus on flavour, not on cuts. I really like the style of nose-to-tail he’s going for, because it means diners won’t just be getting straight-up liver dishes. 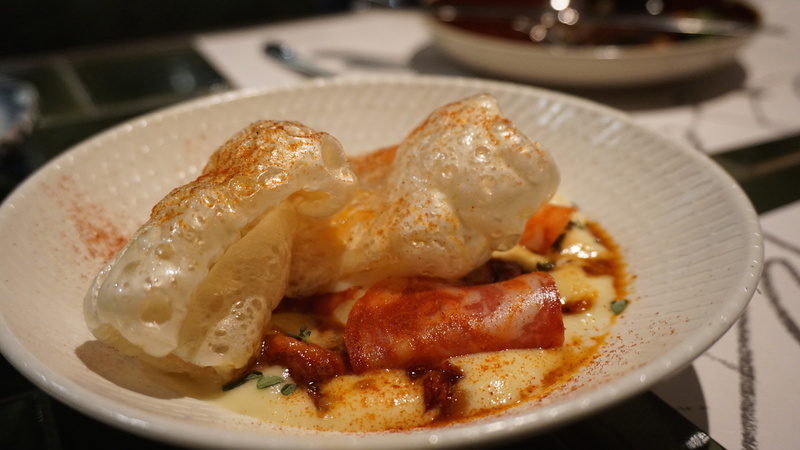 Chef started us out with some appetisers and all time favourites, and the ones which stood out to me the most were the Soft Cooked Eggs ($24++) and Dehesa Octopus ($28++). The Soft Cooked Eggs are classic brunch fare, and being a Spanish restaurant, I could imagine myself enjoying a serving of this smokey, Chorizo-laden dish on a Sunday in San Sebastien. The mash was satisfying, and when it’s mixed in with the creamy egg, it’s totally something to shout about. Add the cracking tufts of pig skin on top, and you’ve got a dish to die for. The Dehesa Octopus impressed in its presentation. 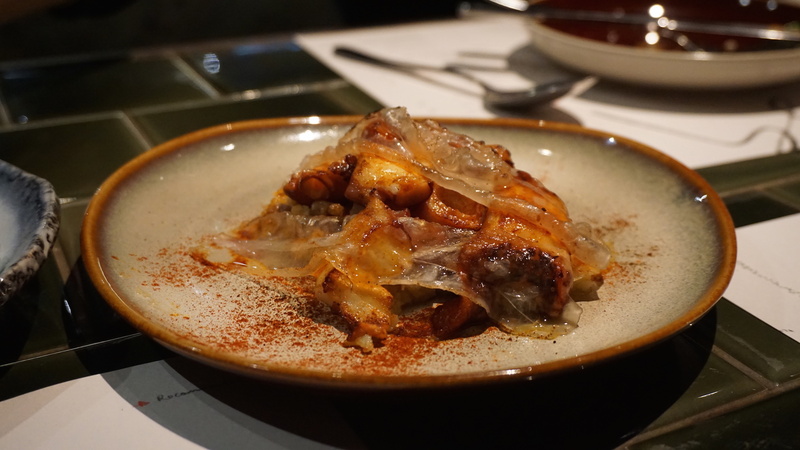 A bed of potatoes and grilled octopus is topped with an almost smothering layer of lard, then blow-torched at the table for effect. The heat breaks down the pork lard quickly, but what you get is a release of fragrance and a coating of flavour on to the slightly charred octopus. I must say, it is a gloriously unhealthy dish. This doesn’t look like a pig’s head, does it? Well it is! This crusted, flat-topped mound of meat is made out of a combination of different parts from a pig’s head, and seasoned to taste. Capers and a smooth egg yolk round out the dish for smoothness and a nice flavour spike. 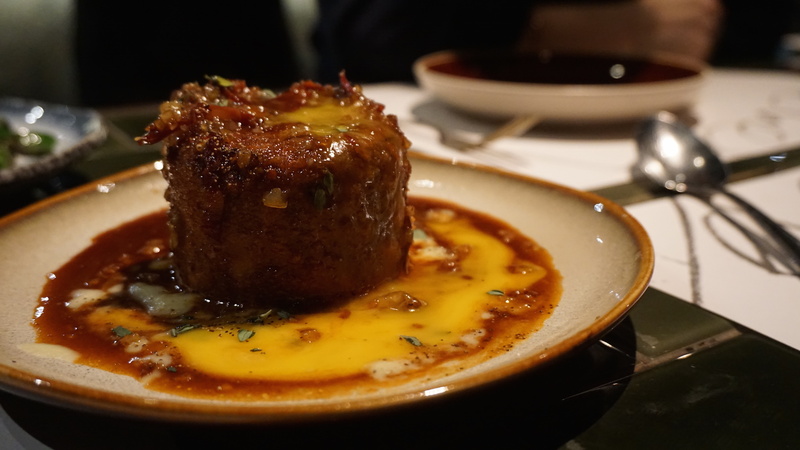 I would have never eaten a pig’s head in any other form, so this dish is something special! Out of the desserts we tried, I recommend the Gin Panna Cotta ($15++) for its commitment to alcoholic greatness. 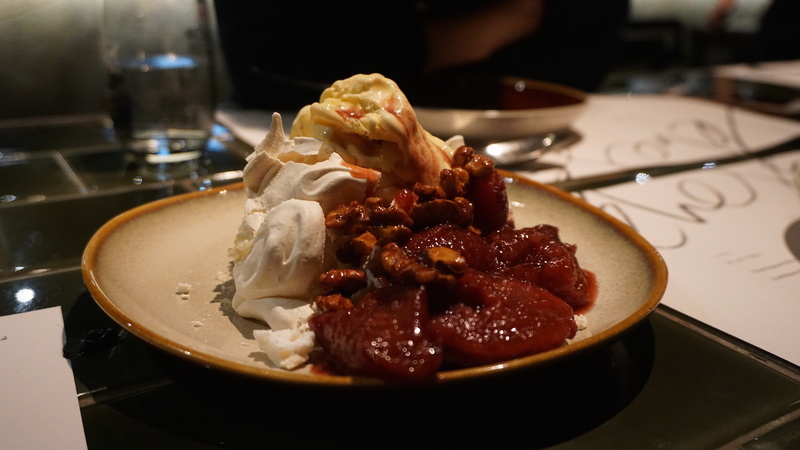 This dessert does not hold back on the gin in its namesake, deploying the increasingly popular liquor in large amounts. 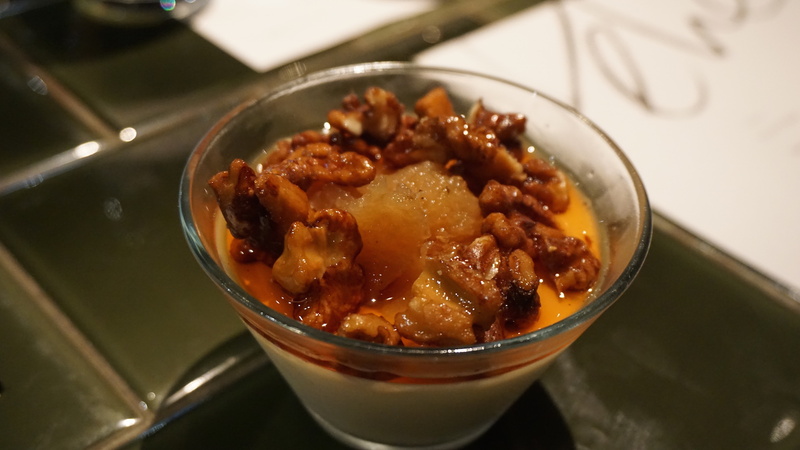 The berry compote, crumble and walnuts that top the Panna Cotta work well with the dessert itself, and I think there’s merit to having a sweetness that cuts through all the alcohol being piled on this dish. 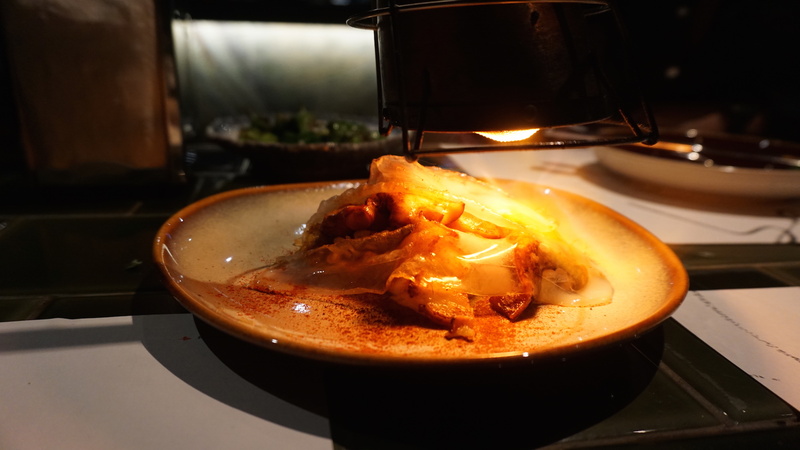 Dehesa’s team has definitely heard the market’s reluctance to embrace nose-to-tail dining, and has done well to adjust its menu to the demands of this price point. 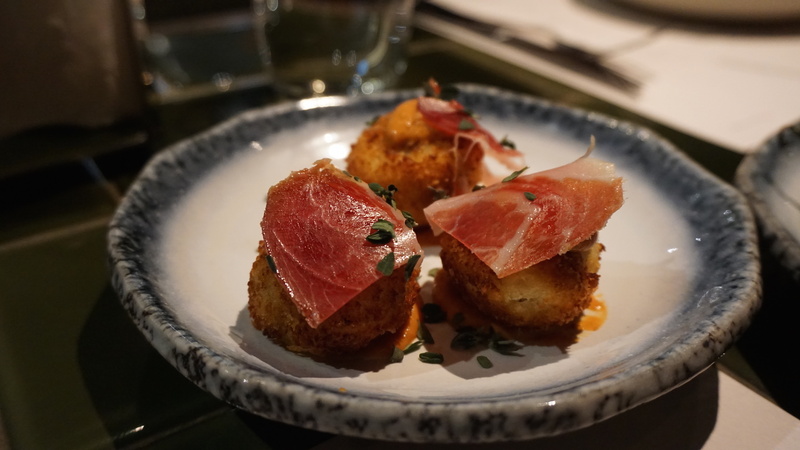 After coming back for multiple meals here after my tasting, I think Dehesa’s standards are well worth the price of entry. Expect to get a solid, high-quality meal in a friendly environment when you dine here, and be ready for a flight of flavours. Weekday Lunch & Weekend Brunches! From Mondays to Fridays, the restaurant serves set lunches at $28++ for a two-course menu and $38++ for a three-course menu. Guests can enjoy handcrafted goodness such as homemade chorizos and house-cured meat platters. Over brunch on Sundays (11am-4pm), guests can tuck into hearty signatures with an all-you-can-eat brunch menu priced at $58++ per pax. Start with a free flow selection of pinchos from the bar, with options such as Gambas Ajillo, Octopus and Ratte Potatoes, and Pimiento and Tomato with Manchego Cheese. The hearty brunch menu also takes guests through starters like the Wild Mushrooms on Toast with Lardo and Smoked Cheese; mains such as Seafood Fideua and Golden Snapper with Chickpeas and Saffron; and even desserts like Apple Tart with Sherry Cream and Lardo Crème Caramel with Candied Bacon. Free flow soft drinks, juice and coffee are available at an additional $20+ per pax, while guests can enjoy free flow cava, house pours, soft drinks, juice and coffee for an additional $30+. From 5.30pm on Mondays to Thursdays, diners can indulge in a Pinchos menu – priced at just $5 nett per dish – that changes depending on the produce that is in season. Options include Tender Octopus, Duck Heart Skewers, Pequillo Anchovies and more. Specially selected beers and house pours will also be available at $5 and $9 respectively during happy hour.